Red Sofa Café is low-key, seriously sophisticated and perched on the rise of one of Vredehoek‘s fashionable streets – on the corner of Derry and Exner. Its WiFi access and plate o’ bacon (yes, that’s a plate of only bacon) seems to have done the trick as the place is already teeming at 9am with the I-work-from-home-but-actually-in-a-café types that manage to look as though they earn their dough simply sipping the froth on cappuccinos and moving their mouse(s) occasionally. Off to one side (I check) rests the red sofa for which the spot is named, although most of the clientèle are perched up on bar stools at the window facing the street, ostensibly working (ja, right). The veranda will slowly fill so that by the time we leave it’s bustling with pre-lunch coffee drinkers (does anyone work in Cape Town?). Red Sofa is already rather a buzz word in the DVD rental arena, and the store is apparently next door. They describe themselves as ‘possibly the best DVD store’. Not sure if that means the best in town, or why they hesitate when it comes to their status, but perhaps it’s a Vredehoek thing. 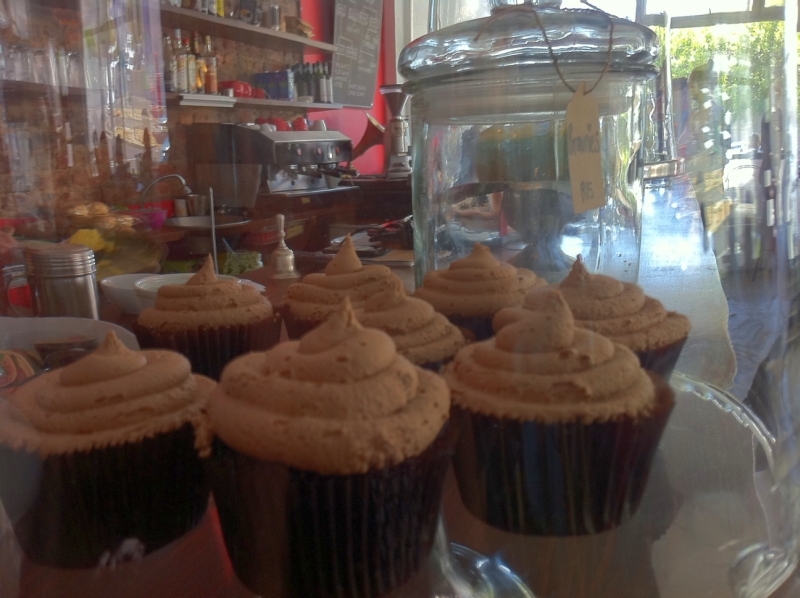 The café is devoid of any of the paraphernalia one associates with coffee shops – there is little clutter, only a few cup cakes beneath a glass jar; the menu is short and sweet, which makes choosing a meal easy, and if you want a drink then you need to consult the blackboard. There a rather interesting (vexing if you’re in a rush and used to the usual written menu) diagram takes you through a series of steps on how to order your freshly roasted coffee. Rather than appealing to me, I get lost on the flow chart at about step two (maybe it’s because I have this not-thing for maths) and finally just follow my eye until it alights on the word ‘decaf’ and hope that I end up with something I like. 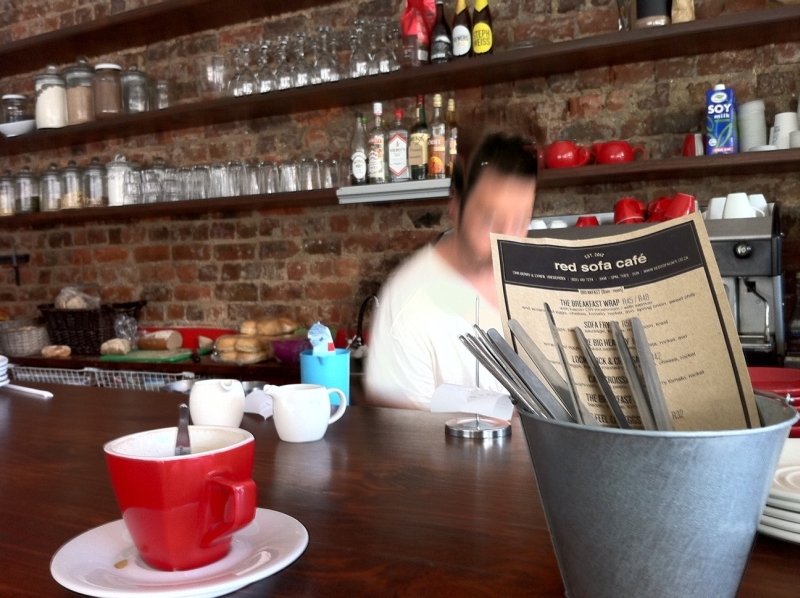 I change my mind mid stride, having seen ‘red espresso’ out of the corner of my eye, which obviously irritates our waitress, whose affected boredom must be compulsory for Vredehoek (you can tell I don’t live there, hey?). But I’m not there for the coffee, or the rather small red cappuccino (which comes in a rather cute angular, red cup and saucer) as my friends and I are playing catch-up – we have only an hour and at least a year to cram in to that space. Whilst I don’t eat they attest to the thorough delight of breakfast, which you can do in a wrap, as a fry-up, a healthy version or as ‘lock stock and croissant’, which sounds appetizing to say the least. The ‘don’t feel like eggs’ brekkie is almost as trend setting as the ‘plate ‘o bacon’ and the prices are good. Lunch includes a number of fillings that you can have in a salad, or in a wrap or sandwich, and there are a couple of standard burgers served with a side of sweet potato wedges. It’s standard enough fare to appeal to everyone, even vegetarians, but with enough of a twist to make it worthwhile for those who like their menu with something a little more stimulating. 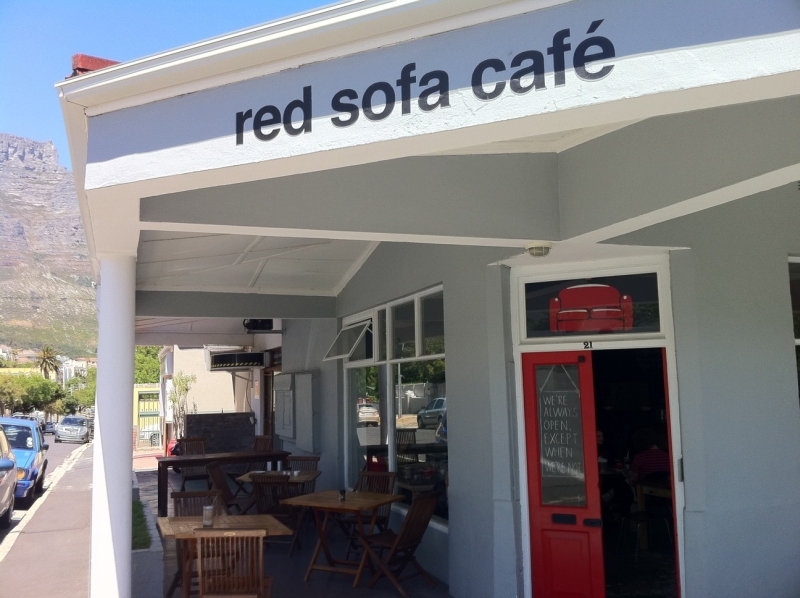 Red Sofa is popular because: they’re open from 7am, they have WiFi passwords like ‘baconroll’, their coffees automatically come with a double shot of espresso, their veranda has views of Table Mountain, and their cheesecake is said to be unmissable. They’re also licenced (which includes both local and craft beers as well as the usual liquor) and open until they close (which is anywhere around 5pm). My favourite lunch is their Pot Pie, a Darling beer, followed by black Americano coffee. We were always served with a smile! Sounds like a great little coffee shop.